The European Society for Cardiovascular and Endovascular Surgery (ESCVS) is dedicated in providing educational opportunities to residents and young cardiac and vascular surgeons. 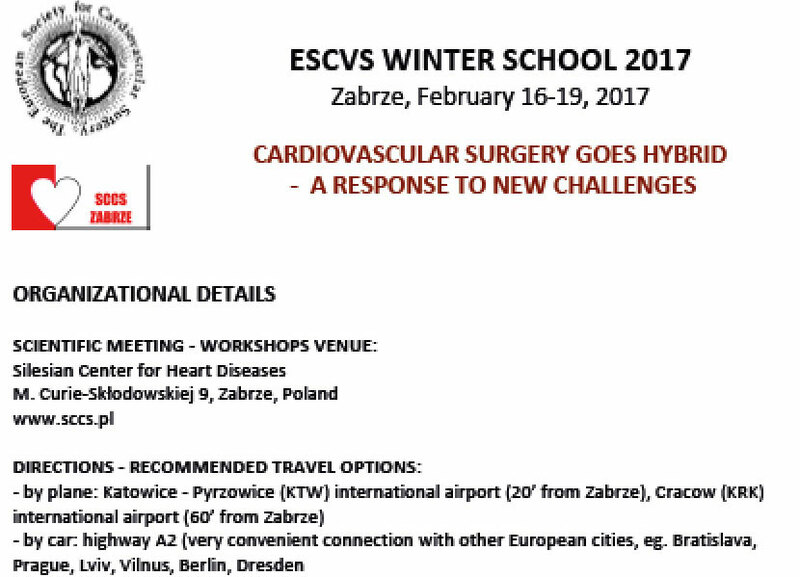 This year’s ESCVS Winter School entitled CARDIOVASCULAR SURGERY GOES HYBRID - A RESPONSE TO NEW CHALLENGES will be held in beautiful city of Zabrze, Poland, from 16th to 19th February 2017. 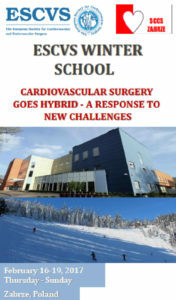 The aim of the winter school is for participants to get acquainted with all aspects of modern hybrid cardiovascular surgical treatment. Interested participants, younger than 35 years of age, are invited to apply on escvsjc@gmail.com with their CV and ID copy (age proof). Granted candidates will be selected by members of Executive Committee of the ESCVS and informed via e-mail. We encourage all interested colleagues to apply as soon as possible as application is open until Sunday, January 29th 2017! We recommend accommodation at Pension Innovation, located at the area of Zabrze medical campus (where Silesian Center for Heart Diseases, Silesian Park of Medical Technology, Medical University of Silesia are located), within convenient, walking distance (2’) from the workshop venue -­ Silesian Center for Heart Diseases.